The gist of Pastor Manoonsak’s sermon at Jai Samarn church in Bangkok was that when people ask why God doesn’t speak to them they are asking the wrong question. The real question is, “Why am I not listening when God is speaking?” No friendship will last long if one party is always talking and asking for things and never gives the other person a chance to get a word in edgewise and share what he or she wants to talk about. God wants his proper share of time to speak with you, and every believer should be able to hear what he has to say. But if you are leading one of his ministries, it is even more critical that you hear from God because you are responsible for stewarding the people and resources God has given your ministry. I am using the term “hear God’s voice” in this post even though I have never heard an audible voice. What I mean is that God speaks in many ways, and ‘hearing’ God means discerning his thoughts. He can ‘speak’ to you through a dream, intuition, an inner voice, a flash of insight from nowhere, someone else saying something that you know is from God, discerning the meaning of circumstances and so forth. Here are some thoughts about how you can better discern God’s voice. This is obvious, but if you want to hear from God you have to stop talking and start listening. This means quiet time, without any distractions if possible. I find that even having reflective music in the background can be distracting, so I often am in complete silence. Once a year I do a one week spiritual retreat on my own devoted to my leadership of CCCC, and I set aside a couple days throughout the year for deep reflection, meditation and listening. But those are special times of intense listening. Listening to God should be a daily activity, actually a constant activity, and since complete silence is usually not possible, I have learned to quiet myself in the midst of distraction and open myself to God’s thoughts. Frank Laubach wrote about unceasing prayer and how even on a busy streetcar he could silence himself before God. I’ll put a couple of quotes of his at the bottom of this post. A chapter from one of his books was given out in a course at Tyndale, but I don’t recall which book it came from. I’ve not read it, but Prayer, the Mightiest Force in the World: Thoughts for an Atomic Age sounds like the likely source. Distractions are not necessarily bad, sometimes they bring to your attention something God wants you to think about. Maybe the best way to think about silence is that it is your silence that is required. It’s really hard to stop all the sounds that are around you, although you can seek out a quiet place if you want. Unceasing prayer does not mean talking to God all the time because it includes listening. What I strive for is a continuous awareness of God and his agenda so that his mission and character permeate everything I do as a leader. But, like Paul, I have to say “Not that I have already obtained all this, or have already arrived at my goal, but I press on to take hold of that for which Christ Jesus took hold of me” (Phil 3:12). Set aside time for God just as you set aside time for family and friends. It seems that the really deep thoughts I’ve had from God have come after an extended time. I certainly have heard God speak in various ways after only a few minutes of silence, sometimes virtually immediately, and sometimes he just interrupts my thoughts completely unexpectedly, but I know the most dramatic experience I have ever had with God came after almost an hour of continuously praising God in silence while meditating on his nature. I wasn’t actually listening at the time, which made the experience all the more powerful. Regardless of how much time you can spend, the main thing is to be receptive to God. Study Scripture to know it inside and out. That way you come to know God’s mind (as much as we can know it) and can learn to incorporate God’s ways into your leadership in real-time, as opposed to reflecting on a situation later. Also, study the biblical leaders to see the good, the bad and the ugly. 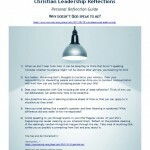 That will help you understand what God expects of you as a ministry leader. I feel a tremendous amount of responsibility as a ministry leader to model Christ’s character and to do the Lord’s will. Knowing that I am still a work in process means that I am continually examining myself against God’s standards for his leaders and that feeds in to my personal development plan. You know, sometimes other people even help me see the areas that are “opportunities for growth!” 🙂 The absolute best book I have read on Christian leadership is the one I reviewed in “Shepherds After My Own Heart” by Tim Laniak. Tim’s theological work is excellent! I find the most effective way to hear from God is to ask him a direct question and then be silent and wait for a response. Sometimes you might just say “Lord, speak to me about whatever I need to hear,” but I also will give God a direct question I want an answer to. Don’t just think about your question. It seems that when I formulate a specific question and ask it (almost always silently), I get a response! Just thinking about an issue without formulating a question isn’t effective, for me at least. Merely thinking about an issue means all I have is a vague notion of a question I would like to ask God someday, but I haven’t actually asked it for real until I’ve said it either out loud or in my head. I know he knows my thoughts, but I think for me at least, he wants a direct question because then I will know he is responding. Ask your questions before you make your plans. Don’t ask God to bless your plans, but ask God for his plans. His ways are not our ways and we can’t even conceive the depths of his mind, so even the very best of our puny plans does nothing but frustrate what God would like to do through us. The Lord broke me of planning ten years ago, and life has never been better! I do think ahead of course, and when the Lord lays out a direction, I do make plans, but I hold to them lightly, knowing that the Lord may provide something better at any time. My plans are just default plans that the Lord is free to interrupt whenever he wants. It used to be that when people said “The Lord told me…”, my response (kept to myself of course) was, “Oh yeah, sure! !” First, I was very, very skeptical of their claims, and second, I always was afraid of mistaking my voice for God’s voice, so of course I never heard from God. But then about 1993 I asked God, “Please teach me to distinguish your voice from mine” and I started to have some pretty amazing experiences. Let me just say that over perhaps about five years, the Lord caused things to happen so that he could say, “That was me!” and I knew that anything else was me talking to myself. And of course he was training me so that on May 25, 2001 when I asked, “God, why do you give me all this vision for my family, my church and others, but no vision for myself?” I was equipped and ready to receive the most direct response from God that I have ever received!! That question changed my life. Suffice it to say, two weeks later I was registered at Tyndale Seminary and three weeks after that I started my first classes and became, at 44, a full-time student. And I’ve never looked back! To help you, I have written on this blog about some aspects of hearing God speak. I wrote about dreams, about designing a spiritual retreat, about developing intimacy with God, about how your personal spirituality affects the public (your staff for example), and about discerning your call. Richard Foster wrote a good introduction to the contemplative life in Streams Of Living Water and a practical book on discerning God’s voice is Listening Prayer: Learning to Hear God’s Voice and Keep a Prayer Journal by Leanne Payne. It’s been some years since I read this book, but I recall it was pretty good. And of course, the one book that stands out above all others for guiding you into a more intimate relationship with God is Space for God: The Study and Practice of Spirituality and Prayer. For the past few days I have been experimenting in a more complete surrender than ever before. I am taking by deliberate act of will, enough time from each hour to give God much thought. Yesterday and today I have made a new adventure, which is not easy to express. I am feeling God in each movement, by an act of will—willing that He shall direct these fingers that now strike this typewriter—willing that He shall pour through my steps as I walk—willing that He shall direct my words as I speak, and my very jaws as I eat! You will object to this intense introspection. Do not try it, unless you feel unsatisfied with your own relationship with God, but at least allow me to realize all the leadership of God I can. I have never heard God’s voice as the writers of the old testament and prophets allege. Many times they describe complete conversations, as in Jeremiah, Daniel and Isaiah. Preachers say “the lord told me,” etc. and I believe they’re liars. Why doesn’t God speak to me, and don’t give me that “you need to listen to him” routine. Not true. From your comment, I understand that you want God to speak to you, and that you are being quiet and still before him in order to give him a chance to be heard. If this is true, then one possibility, which is rare, might be that God is silent in order for you to grow spiritually in some way. This is well attested in Christian history and a phrase was coined by John of the Cross to name the experience: The Dark Night of the Soul. Bob, I hope this is helpful for you. These are not trite suggestions I’m giving. I used to be a person who reacted badly when people said “God told me”. Until I learned to quiet myself before God, I didn’t think God ever would speak to me. I still test everything that people say God said to them (a healthy skepticism is quite appropriate), but I do so knowing that it is a very real possibility that the person did indeed receive direction from God. Hi Gary, you are asking the same question I asked for many years. My reply is the same as the one I gave to Bob Dodson (above). In addition, no “message from God” should be accepted without significant testing, including corroboration by other mature Christians and checking that it aligns with everything that we know about God through the Bible, and so on.